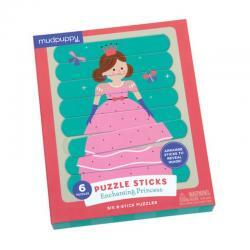 With Mudpuppy's Enchanting Princess Puzzle Play Set, the fun doesn't stop when the puzzle is complete. Use the puzzle as a play area for the eight princess figures included in the box for hours of enchanting fun! 36 piece puzzle that measures 50cm x 41cm when complete. 8 play figures with bases included.